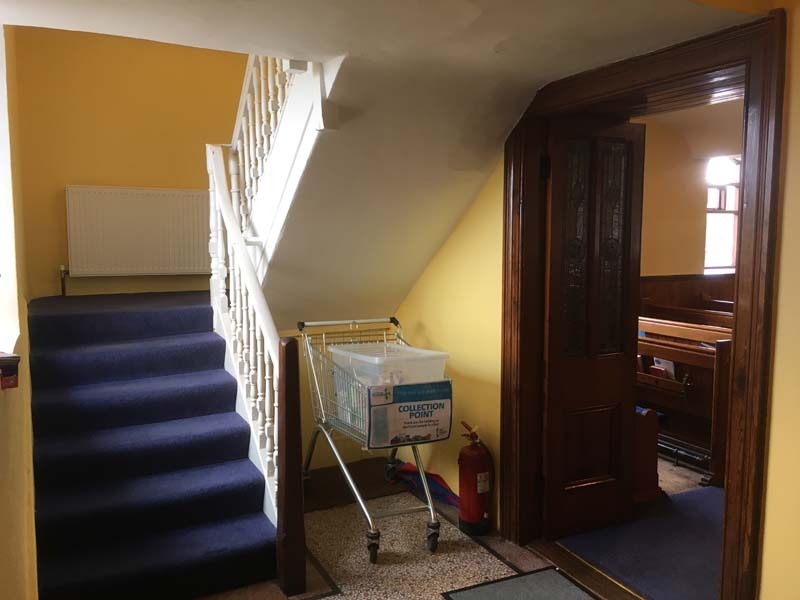 A shopping trolley is not necessarily the first thing you would expect to see when you walk through the doors of Moneydig Presbyterian Church. Yet there it is sitting proudly between the stairs to the balcony and the door into the main sanctuary. So why is it there? In 2016 our campaigners started working towards their charity badge. As part of this they decided to find out more about the work of the local foodbank based at the Vineyard Church in Coleraine. Our older campaigners spent an evening helping to prepare food parcels to be given out the next day. This experience challenged them of the need to do something to help, and so they asked for a trolley to be placed in the church so that food could be donated and used to help those who need it. Foodbanks depend on donations from the public given at collection centres such as the one in Moneydig but also through local supermarkets. The Sainsbury’s store at the Riverside Retail Park has a donation point where food can be left as people leave the shop. Donated food should be non-perishable to prevent wastage. Cans of soup and fruit, dried cereals, long-life milk and biscuits can all be given. There are also several surprising items which are much needed. Toilet roll, sanitary towels and tampons, tin openers, nappies, toiletries and baby food are always welcome. The foodbank provides more than just emergency food, it also teaches people how they can eat well for less by teaching how to shop in a healthier and more economical way. This means the foodbank not only provides much needed emergency help but helps people to help themselves so that they can move away from a place where they depend upon the foodbank. So, who uses a foodbank? I’m sure we all have our own picture of who might need to use a foodbank. 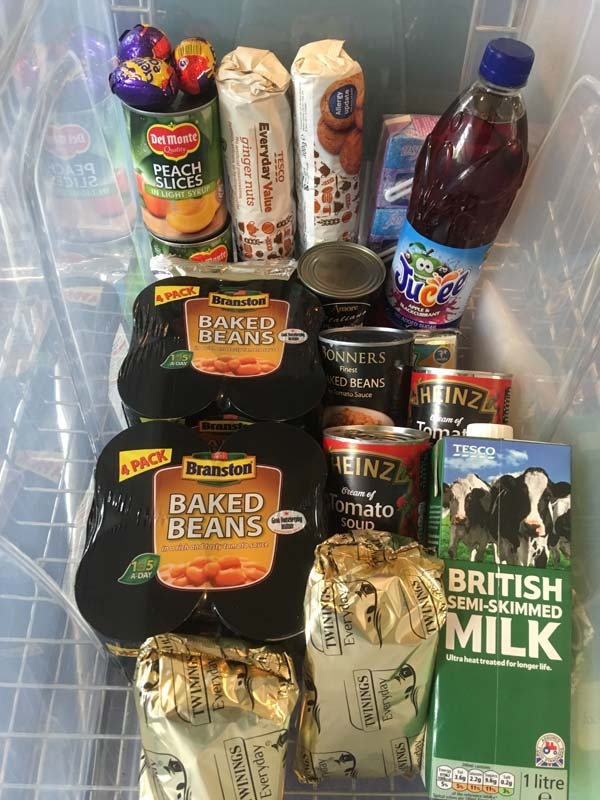 On the Trussell Trust website, the organisation managing many foodbanks across the UK, including the one we support in Coleraine, there is the story of a single mum in Brent who needed the help of the foodbank. Her story is one of someone trying to better themselves, trying to provide for her family. She was a well-educated professional finishing a degree in business management. Yet the cold reality of the economic climate in the UK was such she found herself begging on the street to feed her child. The foodbank provided a way of getting help and preserving the dignity of all concerned. People who need help from a foodbank must be referred, typically by a health professional or through a school or education authority. Someone who has been referred will receive a voucher which entitles them to enough food for three days nutritionally balanced meals. Please do give generously to our foodbank trolley in church. Every time the trolley is filled, Brian Torrens will ensure the food is taken to Coleraine and so we begin the process of filling all over again. Since 2016 we have supplied the foodbank in Coleraine with more than 7 trolley loads of food, a remarkable achievement, but we need to keep it going. Thank you to all who have supported the church in this way. Thank you for honouring Jesus words “And if you give even a cup of cold water to one of the least of my followers, then you will surely be rewarded”. Matthew 10:42. Finally thank you to the campaigners who had the vision to get us as a church serving our community in this way.